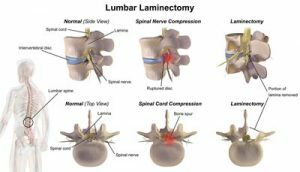 Laminectomy is an operative procedure where the vertebra’s back part known as lamina is removed. Lamina is the part that covers the spinal canal. This back pain surgery is also known as decompression surgery and this procedure is also minimally invasive. Laminectomy reduces the pressure on the nerves as the spinal canal is enlarged in this procedure. Laminectomy or any other back pain surgery is only considered as a treatment option when other conservative on non-surgical procedures like physical therapy fail to provide any relief to the patient. Another major reason for this surgery is when the symptoms of the patient starts getting severe and worsen over time. This surgical procedure is performed commonly to relieve the compression on the spinal cord or nerves due to spinal stenosis. Moreover, laminectomy is also the chosen surgery to treat a herniated spinal disk. This procedure is usually performed in the lower back and neck. Once surgery is done, patient is usually kept under observation for a few days however in some cases patient can also go home on the same day. The patient is shifted to the recovery room and is watched by a health care team for complications and anesthesia. Doctors may also prescribe physical therapy as well as pain killers to improve flexibility as well as muscular strength.